The champion has reappeared as usual, leading after the first five hours the start of the Sepang trial, ahead of Rins and Maverick, shooting at 1:59. Ni battered shoulder or bagpipes ... Nothing changes for Marc Márquez, who has started in front of the time table the Sepang test. The heptacampeón has only rolled until the break of noon, three hours and twenty minutes exactly of the eight hours that the track was, enough to leave the seal with a time of 1: 59.621 that gave him an advantage of 0.259 over Alex Rins, of 0.316 over Maverick Viñales and 0.362 over an amazing Tito Rabat. Spanish entry poker, so that does not change life for the moment in the queen class. And what lasts. Márquez assured before the trip to Malaysia that he would try to do a few laps, but of quality, to take care of that left shoulder of the one that was operated this winter, to avoid that it was still dislocating easily, and give the best indications for the development of the Honda. Well, his shoulder works, because he stuck 29 laps without incident, only some less than the average of the grill until lunch time, and the new Honda, as it happened in 2018, seems well delivered. In the afternoon he chose not to roll, something logical considering that he has to take care of everything that left shoulder touched. The time trial that marked the ilerdense in the Malaysian track is six tenths better than the one marked by him last year in the first day of this test, and is only six tenths of 1: 59.053 that marked Pedrosa in 2015 and that still figures as pole record. 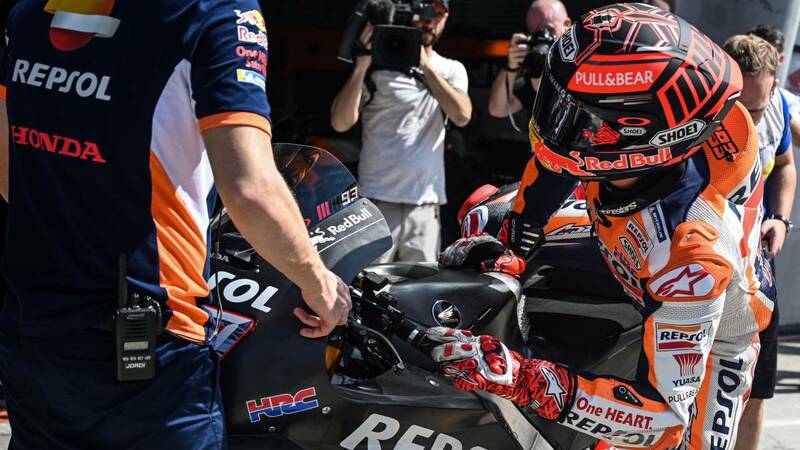 Come on, that this 1: 59.621 is a tiempazo to start and, despite the absence of his teammate Jorge Lorenzo, injury, and his boss Alberto Puig, also due to injury, have plenty of reason to be happy in the box of the Repsol Honda. Also in Suzuki they start on the right foot because Rins and his mechanics emit good vibrations from the beginning. At Yamaha, Maverick started ahead of Valentino Rossi, who finished sixth on the first test day at just over a tenth of his boxing partner and 0.433 of the day's best. It is also a hopeful start for the home of the tuning forks. Among the two Yamaha official appears Danilo Petrucci, which takes 146 thousandths from Dovizioso, eighth, in the battle to be the best Ducati of the day. The runner-up also slipped in front of Nakagami, with a good seventh place. The first ten positions Bradl and Pol are closed. 13th has been Aleix and Mir 23º. Otra unmistakable signal of the great start of the Honda 2019 is the ninth of Bradl, to 0.593 of its head of ranks. The German is the luxury tester this year of the golden wing and in this essay directly occupies Lorenzo's site. If he is able to start like this, what will the Majorcan not be able to do on that RC213V once recovered from his scaphoid fracture. As for the interesting war of the novices, starts a slightly ahead Baganaia with the satellite Ducati Alma Pramac team. The Moto2 champion has been 15th to one second in the head. Behind him have finished Oliveira (16th to three tenths of the reference rookie at the moment) , Quartararo (18th also to three tenths) and Mir (23th to eight tenths of Italian and 1,811 of the head) .